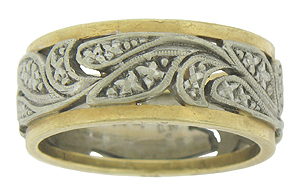 This splendid 14K bi-color vintage wedding band features a central pattern of swirling organic cutout florals decorated with intricate engraving. 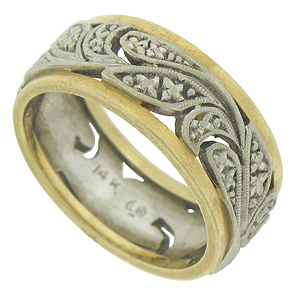 The white gold florals are framed by polished bands of yellow gold. This stunning wedding ring measures 7.69 mm in width. Circa: 1940. Size 6 1/2. We cannot re-size.